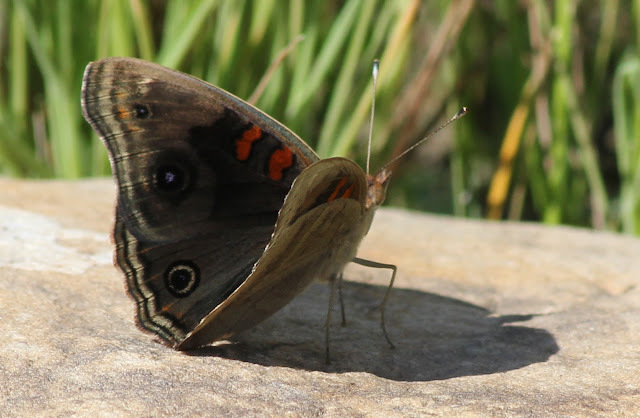 The Junonia ("buckeye") genus has become a complex all of its own. There seem to be intermediates everywhere. Sure some clear-cut examples, at least superficially, exist everywhere too. Junonia evarete nigrosuffusa "dark Tropical Buckeye"
This is typical of the "dark" Tropical Buckeye way out here. However, the immediate difference between "our" dark tropical and the darks in portions of South Texas is on the upperside of the forewings. The largest "eyespot" has basically zero color outlining around it. The thin orange/pink fades then terminates below it. 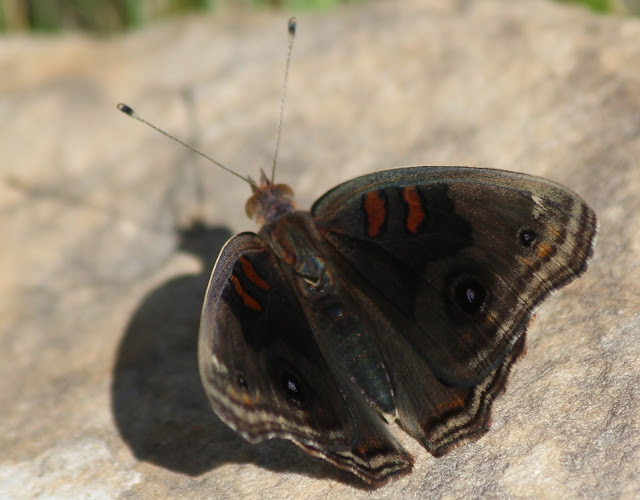 The Junonia-complex is one that needs much further study, though recent research shows that Junonia species have likely been inter-breeding for a long time. 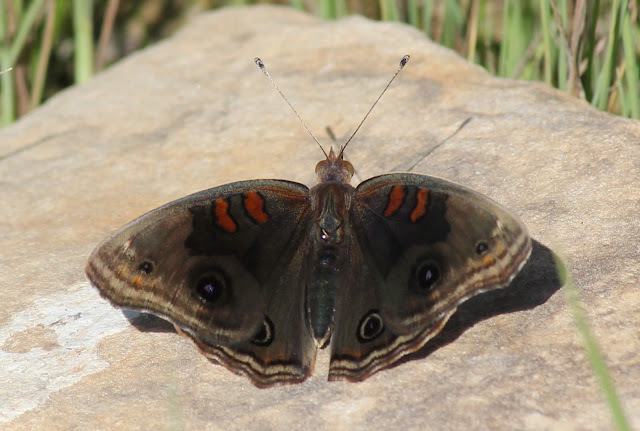 Personal communication with certain authorities have pretty much been "we don't know where to put that dark buckeye that occurs in the trans-Pecos.."
So, dark Tropical Buckeye, (Junonia evarete nigrosuffusa) ? Really? If we must hold onto an ancient common name at the moment, then "'dark' Tropical Buckeye." Beautiful bug with an unknown taxonomical future. Come out and see for yourself. This property will be accessible through guided tours and hikes during the "Birds and Butterflies of Big Bend" event. Click there or scroll up the main page. BTW, the spot where this individual was located is a great Black Phoebe and Vermilion Flycatcher location. While photographing this buckeye, there were two fledgling VEFLs learning of life with an adult pair. Bronzed Cowbirds around there, too. "I think true J. e. nigrosuffusa are in STX-EMX..."
Evolution in motion, I suppose. I have other photos of dark buckeyes from the county from previous yrs, and they don't really vary much from the above individual. At the moment, if you happen across a dark buckeye out here, you'll get an eye-full in person just like the pics above. Never seen buckeye this dark before. I look forward to our fall red form buckeyes here in NC.